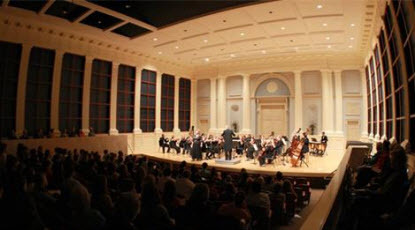 Brock Recital Hall at Samford University has received the prestigious Shutze Award for excellence in classical design presented by the Institute of Classical Architecture & Art (ICAA). Neil Davis of Birmingham-based Davis Architects, who was principal designer of the project, accepted the award at ICAA’s 7th Annual Awards dinner in Atlanta on February 23rd. Named after the renowned architect Phillip Trammell Shutze, perhaps best known for his design of the Swan House in Atlanta, the Shutze Awards spotlight exceptional architectural and interior design achievements inspired by classical design principles, proportions and motifs. Evidence of such classical inspiration is found everywhere one turns at Brock Recital Hall, from the bowed exterior façade with Palladian windows, to the cherry-paneled lobby patterned after an English long gallery, to the intimate 333-seat interior conceived as a Doric temple turned inside out. The design of the interior performance space draws inspiration from the Odeon of Agrippa, an ancient concert hall. “We are not surprised by the accolades that Neil Davis and his firm continue to receive today, as they help us stay true to the original Georgian style inspired by classical antiquity. We also appreciate their ability to produce buildings that are thoroughly modern in every technical sense,” the Samford president added. Coordinated by ICAA’s Southeast Chapter, the 2013 Shutze Awards design competition attracted more than 50 submissions from 35 different organizations, individuals and firms across the Southeast. Only 10 awards were presented, including the recognition to Davis Architects for classical design excellence in the commercial/civic/institutional category. Now celebrating its 101st year, Davis Architects is Alabama’s oldest architectural firm in continuous practice. Since 1912, the firm has created award winning architectural and interior designs for schools, churches, colleges and universities, libraries, multi-family and mixed-use projects, as well as performance venues for music, theatre and athletic events. The firm also sponsors The Davis Architects Guest Artist Series at Samford.